Mazda’s MX5 is one of the best driving cars on the planet, which calls into question why today’s Nice Price or Crack Pipe candidate has only gone 23K. Let’s see of those low miles add up to a high, but maybe acceptable price. The phrase ‘one man’s meat is another man’s poison’ is generally attributed to the Roman poet and philosopher Lucretius Carus, which proves that people have been calling into question the taste of others for at least two millennia. It’s with good reason too, at least with cars like last Friday’s wildly customized 1969 Volkswagen Bug as examples. Poison is perhaps too strong a word for it, but its $8,900 price proved sickening to fully 93-percent of you. That resulted in a crushing Crack pipe loss. If that VW was an example of a car with limited appeal—say to one individual only—I wonder what might be a car that offers near universal allure? Well, yeah a Miata of course. I mean, duh. Yes, that was a bit of a rhetorical question as pretty much everybody has a soft spot in their heart for Mazda’s retro roadster. We all really like the first generation—the ‘NA’ to those who like to host pedantic parties—because it’s the only one with pop up headlamps. I mean, who doesn’t love those? Upon its debut the first generation MX5 was offered in just three colors—Mariner Blue, Classic Red, and Crystal Meth White. Yep, American red, white, and blue for a Japanese car that was aping a style originally made popular in Europe. See, multiculturalism does work! Today’ we have a blue 1990 Mazda Miata, and it’s notable for its condition, which is I guess, related to its meager mileage. There’s only 22,712 miles showing on the clock, and that makes one wonder how anyone could have shown such resolution against enjoying what is obviously such a fun car. So, how does a 23K Miata hold up? Pretty well overall. 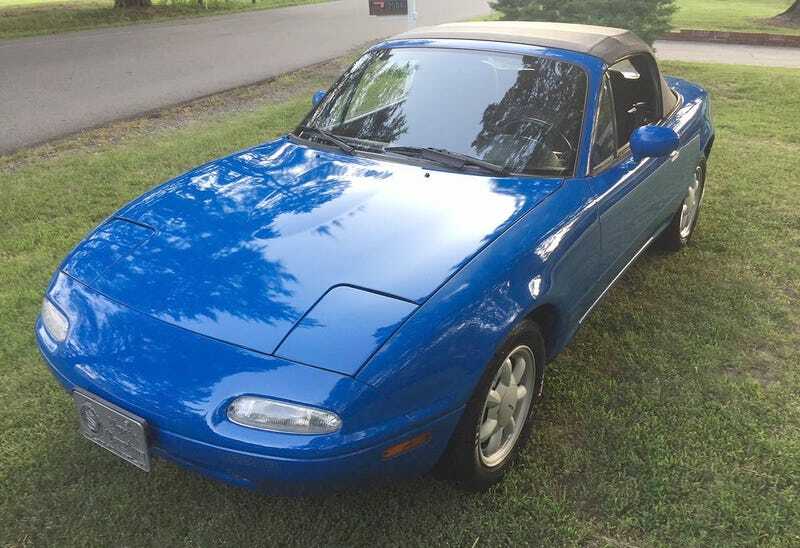 The seller claims that the car ‘drives , runs , and behaves like a new Miata.’ The Mariner Blue paint is still keeping up its end of the bargain here, and just so happens to be my personal favorite color on the early cars. The top is new and looks to be without issue. Factory alloys underpin and that’s where you start to see this car’s age creeping in. The center caps on these are painted plastic and that paint is wearing thin on a couple of the caps, letting the sickly yellow plastic beneath show through. That’s not a big deal, and curb rash or some egregiously ugly aftermarket wheel would be much more troubling. The Uniroyal tires wrapping those wheels are said to have plenty of tread left, but yeah, they’re Uniroyals. The interior is in fine fettle, with seats, carpet and mats that look factory fresh. It’s not all unicorn rainbow farts in here, however. The center stack plastic shows a crack in the corner of the double DIN radio opening, perhaps a result of the factory jam maker having been replaced by an aftermarket unit. A basket style cupholder has been screwed into the console cap, marring that as well. These are both very minor issues that would be easy to rectify. This appears to be an ‘A’ package car, evidenced by its alloys, leather wheel, and Armstrong window winders. It does have power steering if that matters. Other plusses include a new battery and A/C that has already been converted to R134A. Also the title is clear. Actually, I guess there’s a lot of plusses here. I mean, it is a Miata, and it has that crazy unused odometer. The question is, could those plusses all add up the seller’s $6,999 asking? That’s what we’re here to find out. What do you think, is this super clean and tidy MX5 worth that $6,999 price? Or, are there too many Miatas out there that may not be as nice but are easily half the price? Raleigh, NC Craigslist, or go here if the ad disappears. H/T to wantafuncar for the hookup!